Citimark has commenced construction of its $120 million Hercules project at Portside Wharf in Brisbane’s Hamilton Northshore precinct. The development has enjoyed an off-the-plan sales run since it was launched in December last year, with more than 95 per cent of apartments valued at $105 million now sold. Leading contractor Hutchinson Builders has been awarded the construction contract following a competitive tender and began work onsite last month. 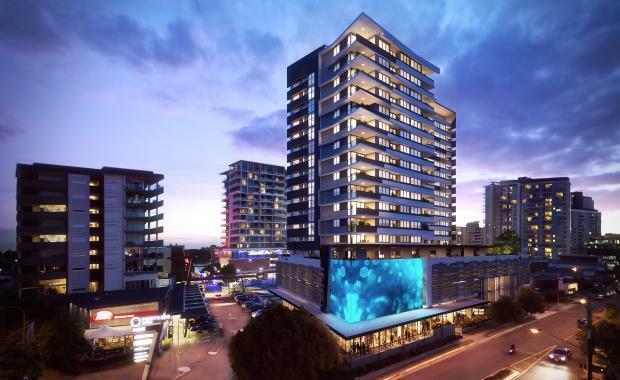 Citimark Properties joint managing director Robert Pullar said Hercules’ Portside gateway location, residential amenities and high quality finishes including an innovative two storey, 30m digital screen located on the building’s facade had been major drawcards for buyers. “The design and finishes of the apartments are synonymous with riverside living,” Mr Pullar said. “We believe Hercules has set a new benchmark for attainable luxury riverfront product in Hamilton. The 2963 sqm site is located at the entrance of Northshore Hamilton’s Portside Wharf, just six kilometres from Brisbane’s CBD and will feature 228 residential apartments across 16 levels. The project will offer a north-facing podium level boasting multiple resort and spa-style recreational zones. Marketing agent Paul Lambert of McGraths said the positive response to the project was reflective of Hamilton’s evolving urban renewal. “Northshore Hamilton is the largest urban regeneration project in Brisbane – six times the size of the Brisbane CBD,” he saidHercules will comprise 84 two-bedroom, two-bathroom designs plus a number of one-bedroom configurations, including 32 one-bedroom apartments, 56 with one-bedroom plus a study and a further 56 with one bedroom and a multipurpose room. Apartments at Hercules range in size from 51sqm to 77sqm and are priced from $369,000 for one-bedroom apartments with two-bedroom apartments from $520,000. Construction is due for completion in mid 2017. Hercules is part of Citimark’s $1.5 billion diversified development portfolio which is currently focused on South East Queensland. Past projects include the $120 million Evolution CBD riverfront residential tower; multi-award winning $95 million, 42 level Felix Tower; $155m Central Brunswick riverfront urban renewal in Fortitude Valley; 330 lot Emmadale Gardens residential community in Gladstone; and an $85m sub-regional shopping centre in Melbourne.